AnyMP4 Audio Converter for Mac 8.2.8 Free Download - Convert audio/video to MP3, FLAC, WAV, WMA, AAC, ALAC, AC3 and more on Mac. 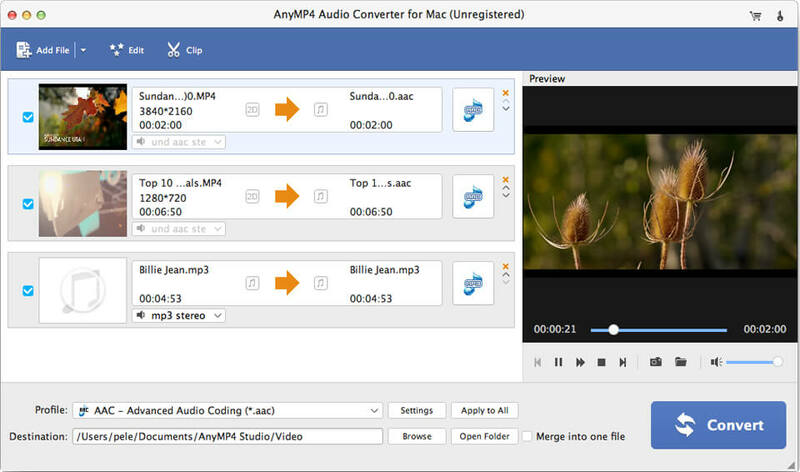 AnyMP4 Audio Converter for Mac enables you to convert audio to any audio formats including MP3, FLAC, WAV, WMA, AAC, ALAC, AC3 and more with fast speed. Besides, it can help you extract audios from the video files, and then convert the extract audios on Mac. Apart from that, it allows you to trim the audio length, merge several audios into one single file. Therefore, you can enjoy these audio files on iPod Nano 7, iPod Touch, iPad Mini 3, iPad 4, iPad, iPhoneSE, iPhone X/XS/XR Maxs, Zune, PS3 and other digital devices. This software owns powerful editing functions, so you can trim the audio to your needed length by clicking &quot;Trim&quot; button. You can merge several audios into one single file according to your needs. Meanwhile, you can rename your audio. With the unique name, you can find your audio more easily. Statement: First, please download the orginal installation package by clicking the download link. Of course you may also download it from the publisher's website. Using AnyMP4 Audio Converter for Mac crack, key, patch, serial number, registration code, keygen is illegal. The download file hosted at publisher website. We do not provide any download link points to Rapidshare, Hotfile, Depositfiles, Mediafire, Filefactory, etc. or obtained from file sharing programs such as Limewire, Kazaa, Imesh, Ares, BearShare, BitTorrent, WinMX etc. Software piracy is theft. If you like AnyMP4 Audio Converter for Mac please buy it.